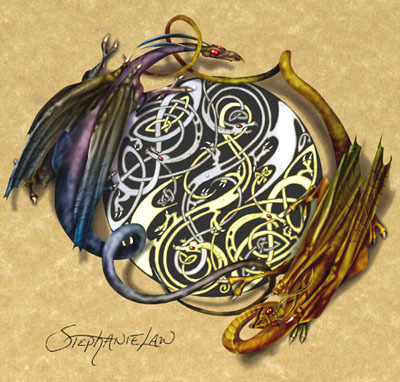 This image created by Stephanie Law. Visit the Link at the bottom to her wondeful homepage. I apologize for the long time between updates on this site but life finds a way to make one very busy when you least expect it. I have been working in greater depth with my coven and students of the last few years, and found my self with decreasing amounts of time to spend on my writings. No sooner than I find myself with time again to write than a new project has taken form which is taking a great deal of my time. I have begun to craft Personal Power tools and selling them online in conjunction with another sage friend of mine. We have entered into a partnership and I have been writing the website for that business. The items are entirely custom crafted from templates we show online, so no two are ever the same. I encourage and ask you to please pay a visit to our online store, browse around and look at the things we are offering. There is a link in the left hand frame, and the website address itself is daretodreamtoday.tripod.com. In this modern age it is difficult to find ones niche and make a living at it, and my friend and I have been working at this for sometime, and I think the results of our works are wonderous. We are offering a variety of traditionally crafted Native American Dreamcatchers, Horn Chokers, and items of my own designing like our wands and my pride and joy, the Spirit Lance. Take a look around and if you have any questions or would like your own personal creation made feel free to email us at the address there. I cannot stress enough how fantastic these things are, the photos do not do them justice since I am still an amateur photographer. My name is Lunarian Stormbringer. I am a coven Elder of the Circle of the Sun Beneath the Sea, and have been a High Priest for the last decade or so. This page is dedicated to my Magical research in many areas, such as Dragon magic, Totem magic (Bear specifically), and others as I publish them. I have spent a great deal of time working on the things you will find here, and would very much like to hear anything you have to say about them or if you have any questions. In order to preserve page speed I have broken up and moved the webrings to their own pages. If you are looking for pages like mine, then these are the best resources out there for you! Some of these pages may take a few moments to load depending on modem speed, but the images are well worth the wait.Should you chose to reprint or copy any of the works herein, I ask that you give credit to me when you do, other than that, they are yours to use. Enjoy!